Dramatic action follows news of a legislative filing in Nashville that would have prevented name changes; Council saw bill as threat -- one member calling it a "war of aggression by our northern neighbor in Nashville." The emotions of debate on the name-change resolution show on the faces of Bill Boyd, Lee Harris, and Myron Lowery. Galvanized into action by a bill filed in the Tennessee General Assembly but not yet acted upon, the City Council voted Tuesday to change the names of three downtown city parks that had been named in honor of the old Confederacy or for Confederate figures. 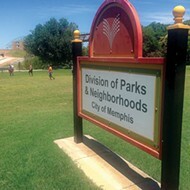 By a vote of 9 ayes against 3 abstentions, the Council changed the name of Forrest Park (which is managed by UTCHS) to Health Sciences Park; Confederate Park to Memphis Park; and Jefferson Davis Park to Mississippi River Park. The action, taken toward the close of the Council’s afternoon public session, came on a resolution that consolidated drafts by Councilman Lee Harris and Council attorney Allan Wade, and it followed a stormy morning meeting of the Council’s Parks Committee, at which Council members had reacted to news of HB553 by state Rep. Steve McDaniel of Parkers Crossroads and state Senator Bill Ketron of Murfreesboro. That bill, which had just been filed, declared that “[n]o statue, monument, memorial, nameplate, or plaque which has been erected for, or named or dedicated in honor of…” the bill then names a seemingly complete list of America’s wars, including the Civil War “… located on public property, may be relocated, removed, altered, renamed, rededicated, or otherwise disturbed." Similarly, the bill would prohibit name changes to any "statue, monument, memorial, nameplate, plaque, historic flag display,school, street, bridge,building, park preserve,or reserve which has been erected for, or named or dedicated in honor of, any historical military figure,historical military event, military organization, or military unit" on public property. 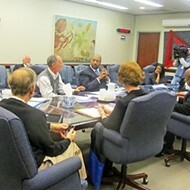 A consensus of defiance apparently formed between the committee meeting and the afternoon public session similar to that expressed by the Council in February 2010 in response to maneuvering in Nashville related to the surrender of the Memphis City Schools charter. Council members united around the Harris-Wade resolution, having reacted to the McDaniel-Ketron bill as if it were a threat to local sovereignty and an imminent one at that. Councilman Shea Flinn referred to it as "the ironic war of aggression from our northern neighbor in Nashville," and Council member Janis Fullilove, who pointedly noted the Republican sponsorship of the bill, called it a "snake" needing its "head cut off." Councilman Harold Collins said, "I don't care if the name is Nathan Bedford Forrest. He's a dead man. We need to be focused on the living....but we will never let the legislature in Nashville control what we in Memphis will do for ourselves." When the vote was taken on an immediate name change of the three downtown parks, only three Council members — Jim Strickland, Kemp Conrad, and Bill Morrison — demurred, choosing to abstain, though, rather than voting no. Just previous to the vote on the name change, the Council had passed unanimously a resolution by Strickland creating a multi-disciplinary committee to study the issue of names for the three parks. That committee is to be composed of “two members of the Council, two university professor, an NAACP rep, a member of the Shelby County Historical Commission and the Parks Director or designee, “ and it will meet as planned, even though the issue it was created for has at least temporarily been resolved. Both Strickland and Flinn, a vigorous proponent of the Council resolution, agreed that, formally at least, the changes were only temporary and had been made so as to make any legislative action on the McDaniel-Ketron bill moot. The two Councilmen opined, however, that the parks were unlikely to revert to their former names. That conclusion was also reached by Wade and Harris, who reckoned such a chance as non-existent. Flinn, who served a brief appointed term as a state Senator, was asked if the Council’s action might be seen as hasty, inasmuch as the filing of a bill in Nashville, even one more mainstream than the McDaniel-Ketron bill, normally is followed by assignment to committees in either house. Then come several rounds of debate both in committee and on the floors of the two chambers before it might come to a vote weeks or months later. And that’s before the governor chooses to sign it or not. “That’s how it’s done until it’s not,” Flinn answered. Harris was frank to acknowledge that he had prepared a draft of his resolution weeks ago, before he or anyone else had any news of a bill in Nashville that might impinge on the renewed controversy regarding parks that commemorate aspects of the Confederacy. “It worked out just fine for us,” he said of the effect caused by the bill in committee. “This is the New South,” he said exultantly. The parks controversy, which had focused largely on Forrest Park, site of a statue of General Nathan Forrest as well as the gravesites of Forrest and his wife, erupted again recently after an eight-year equilibrium. There had been serious controversy over Forrest Park in 2005 — stemming from the fact that Forrest, a bona fide military hero, had been a slave trader before the Civil War, had been accused of massacring black Union troops during the war, and founded the Ku Klux Klan afterward. The then Center City Commission passed a resolution calling for renaming the park, but the City Council failed to act on it at the time. Nothing much had happened to re-open the matter until recently, when Lee Millar, a member of both the Tennessee Historical Commission and the Sons of Confederate Veterans, organized a fund-raising campaign that netted upwards of $10,000, which went toward erecting a bold granite marker on the Union Avenue side of the downtown park, saying “FORREST PARK” in caps. Millar would later furnish a 2011 letter from then city parks director Cindy Buchanan seemingly approving his plans to create such a marker, which was embedded in the park in late spring of 2012. When the Flyer asked about the marker in early December, city CAO George Little maintained that there no records of an official approval, and he would hold to that position even after the surfacing of Buchanan’s letter, which he and various other city and civic officials would later declare insufficient to establish compliance with protocol. Shelby County Commissioner Walter Bailey, a leading critic of the Forrest connection during the 2005 discussions, had complained about the new marker in October, but nothing much had happened until Little was questioned about the matter in December. He said then that the city’s two options were to leave things as they were or to uproot the marker. Ultimately he decided on the latter course, and Millar and others responded indignantly. 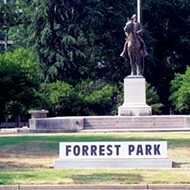 Critics of the idea of commemorating Forrest were re-animated as well, and the net effect of the marker affair was to generate new calls for changing the function of Forrest Park, as well as the two others. Several Council members came up with solutions, like Myron Lowery’s suggestion that the park have a dual dedication, to Forrest and to Ida B. Wells, an early Memphis civil rights icon. Then came Tuesday’s action. Wade says that Millar confided to him during the morning committee session that he had contacted Rep. McDaniel, advocating something like the bill that was introduced, as a protective measure. If so, Millar, despite his obvious unhappiness with the result, had for the second time within a year played a major role in bringing it about.